The Front Page 5 Widget Area has 2 widgets. Many people assume they <strong>have</strong> to utilize every little space they see on a demo site like this one, but that couldn't be further from the truth. How would you know, though, if no one told you? I'm here to make sure you're informed! Don't want to use this home page? 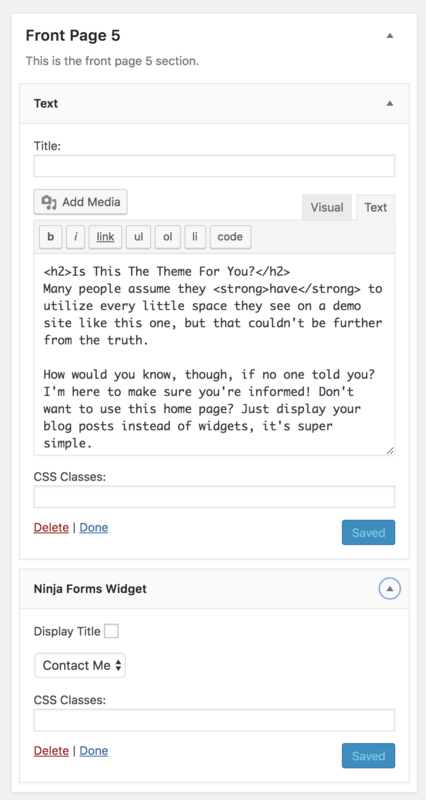 Just display your blog posts instead of widgets, it's super simple. Make sure you copy and paste that into the "text" tab of your text widget, and hit save. Next you'll want to drag a "Ninja Forms" widget beneath the text widget, and select your desired form from the dropdown menu. If you have not created a form to use, you can do that under your Ninja Forms menu. Once you've created one, and saved it, it will appear in the dropdown menu of your Ninja Widgets. If you do not see the Ninja Forms menu, you likely have not installed that particular plugin. You'll find a link to download that plugin here.